Dolly Sods was pretty cool. Very straight roads, rocky and pretty quiet this morning. There were a few areas with larger clusters of cars around the hiking trails but no one else was on the road. We got the northern end and there was a much larger congregation of cars and a nice overview of the mountains from the ridge so we stopped and took some more pics. Sometime the previous day I had suggested about getting a picture of the two of us together so we figured this was a good a place as any. We were trying to set up some contraption of balancing the phone on a rock with gloves and setting the self timer but gravity wasn't cooperating. There was a hiker that had just gotten into his car and was starting to drive past when I flagged him down and asked if he'd mind taking a couple for us, which he didn't. We continued on down the hill and bid farewell to Monongahela. Right by Sulphur City there was a section of gravel (our last?) that bypassed a bit of 42 and 46, County Route 42/4. We passed a bunch more dog-laden pickup trucks and then caught up to a SxS. He had a big rear view mirror and I know he saw us so I gave him a minute or so...but he's just puttering along in the middle of what is maaaaybe a 1.25 lane road. I give him a single super-quick beep of the horn expecting he'll yield...nope. Just talking to his passengers ignoring us. The road straightened out a little and I could see and there was room so I blasted past. I think he actually moved over a little for Micah. Seriously, what is wrong with these people? We merged back into 46 and a few miles later passed the Bridgeford charcoal plant paused for a moment on the bridge over the Potomac to MD and that was it. Micah knew Keyser, WV, a few miles to the east, was a larger city and would have gas so we'd both top up and split up. He was looking to take 220 north and I was looking to head east on 46 for a bit more. We had actually crossed into MD to go east but I kind of wish we didn't, just down the street is Luke, MD and basically the only thing in that town, the Verso Corporation. I couldn't tell what the plant was all about but before we got into town we started smelling something very unpleasant. We got stopped at a light right across from the plant and I said "Can you imagine actually living here?" An emphatic "No" was the response. I looked into it after I got back home and Verso is a paper company. Apparently the smell is the plant burning black licquor. "The substance, a mix of caustic chemicals and wood waste left over from the papermaking process, was once pollution, a byproduct that fouled the rocky banks of the Potomac." Somewhat interesting article here. Just a little down the road we saw a gas station so just stopped there to top off, use the facilities, grab a bite to eat and plan our split up. A couple miles later Micah peeled off onto 220 N and I headed home. He had a slightly more interesting route planned for home hitting up some of the MABDR in PA.
Don't have the GPS shot but according to the tracks it was 78.1miles, 3:31 elapsed, 40.9 mph moving avg, 1:54 moving. Thankfully it was early in the day so I was able to use my "slower" route home which was great. It was a nice mix of mostly paved but a few gravel bits working across the panhandle of WV, crossed into VA near Good, WV and then went back a forth a few more times before finally ending up staying in MD. I stopped in New Market to gas up for the last time, grab a quick bite to eat and use a restroom. 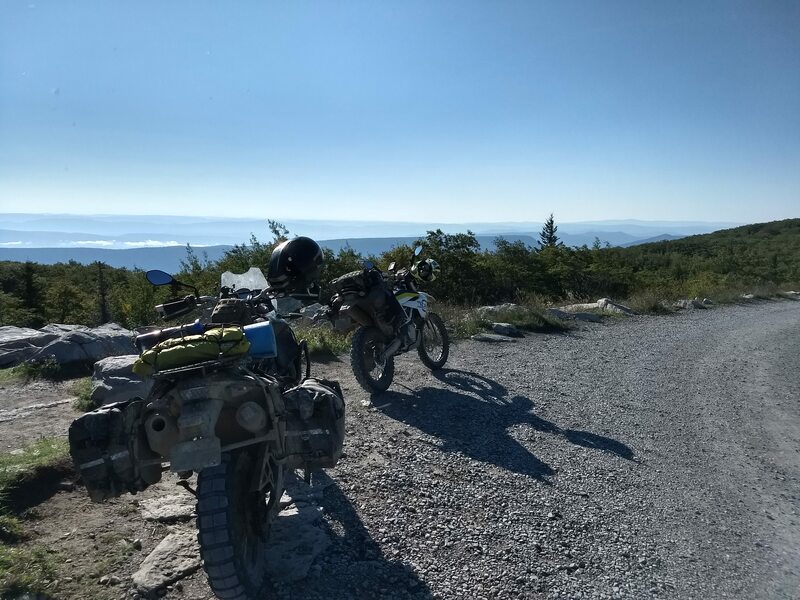 I realized I missed riding in the remote areas of WV because we basically just stopped wherever we wanted to pee on the side of the road the whole trip. I got home at 4:43pm after another 224 miles so 302 for the day. According to the tracks I have 1382 miles over just shy of 40 hrs driving time with an overall moving avg of 34.7. Just the TWVT we did was 843 miles over 29.25 hrs driving time with an overall moving avg of 28.8. This is pipeline country and more like foothills. Nothing terribly steep. More of the same, the peak starting just before 190 miles is the Jeep trail over the mountain on our way towards Fayetteville. The high peak around 80-90 miles is Bluff Mountain ~3365 ft. The twin peaks (heh) are Paddy Knob and the ridge where the Camp Allegheny battlefield is. 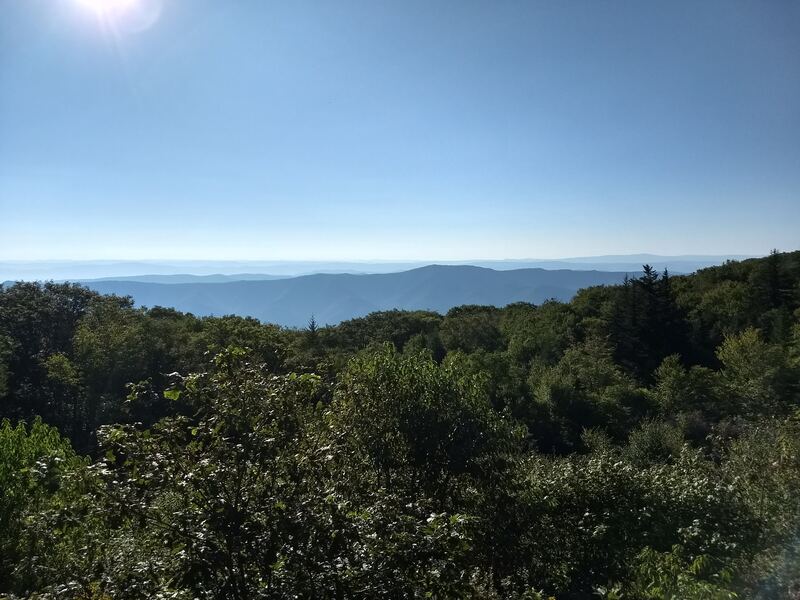 The plateau from 15-30 is Dolly Sods, right around 4000 ft. The second larger peak at 60 is Black Rock. All in, I had a great time and honestly I think it was made better by doing the ride with Micah. I mean, I flushed all the yippee dogs out, he's the one that really had to deal with them . Pretty much every time we'd talk to people they'd almost universally ask "Where are you headed" and we'd toss out some major town or the general direction. Some would offer directions or ask if we're taking such and such interstate. And we'd just explain that we're already where we're trying to go by being on this ride. I've done a lot of longer (paved) trips over the last 10 years and I always love going down the (cliche warning) road less traveled and just soaking in the country. I grew up in southern NJ in Gloucester County (I bet people from MA can pronounce that correctly) in a fairly rural area but I have seen such a diversity of people and living styles it gives me a greater appreciation of the differences in people and why they might have differing viewpoints. 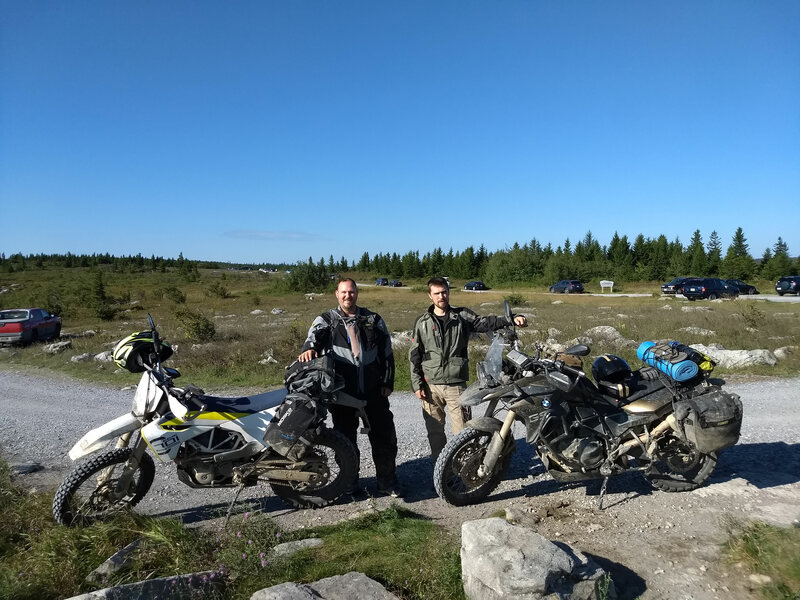 This was my first multi-day "Dual-Sport" ride and I plan to do many more and see even more of the road less traveled in the future. The 701 was great on this trip. No mechanical issues whatsoever (mudflap hole?). Also no issues with my relatively new Tubliss install and other than the aforementioned wear issues (I'm trying a non R version of the GT723 next which other people have gotten much more out of), I loved the GoldenTyre GT723R tires. Even not aired down they're pretty good in gravel/rocks and they gripped on the road as much as I wanted them to but aired down to 15psi for most of the trip I can't say that I ever had any grip issues. They make some sizes for bigger bikes. I've seen reports of people using them on Africa Twins and KTM 990s. Yeah, they're a little more expensive than a TKC-80 (stock tire) but even the R version lasts longer and has wayyyyyyyy better traction. The Mosko Moto Reckless R80 was just shy of great. Wasn't too bad to unflip the beaver tail and move the stinger out of the way a couple times a day to gas up. I still had room to carry more stuff so the size is good. I can't see being able to do a longer trip like this and camp with an R40. I never felt like the luggage was cramping me while riding sitting or standing or limiting me from moving forward/back on the large seat on this bike. My camping gear was in one whole leg. Clothes, food, tools, toiletries in the other with some random stuff like electronics, air pump, sandals, pants liner in the stinger. The heat shield fell off (pretty sure I mentioned that) on day 1 and I need to get another band clamp, or maybe not since I did the rest of the trip with no issues (?). For mounting I have the Perun heel guards that have slots but I've seen a few other people mention a different way that I'm going to try next and that's putting my passenger peg mounts back on but removing the pegs and trying the legs off to the end of the mounts. The right side leg liked to sag down a little no matter how much I tightened up the straps and was gradually rubbing on my rear brake caliper as the suspension worked. Mounting to the pass. peg mounts will make the strap length a lot shorter and keep the legs out of harms way. I don't have a whole lot of experience with "great" suspension but the stock suspension on the 701 is really good to me and I'm not quite double the intended weight. It's my plan over the winter to re-spring the bike front and rear and I'm curious how much "better" it's going to feel. My Garmin Montana did fairly well. It did glitch out maybe 3-4 times where the distance to next turn and distance to destination fields got stupidly large numbers in them but the route seemed to keep on working fine. I just stopped navigation and reloaded the route each time and it was back to normal. I use the AMPS cradle attached to a RAM handlebar mount, cut the wire short to the cradle, isolated the + and - and wired to my bikes unswitched accessory plugs behind the headlight mask. The next time I'm in there I'll probably swap it to the switched "just in case" but if not, it's probably fine where it is. I had my old Nav IV hardwired to the battery on the DRZ. I'm using OpenStreetMap maps on it and had the topo ones in particular it was useful a few times while we were on the alts getting an indication of what's ahead, also nice seeing very clearly that you're on a ridge. Overall the data is great but one thing in particular that I'm noticing is that road names are sometimes just completely different. I even joined the organization and made my first edit to correct an error on a local ride I do. For charging phone/action camera I had a cheap SAE to dual port USB converter. With my old BMWs, I used to carry a powerlet to cig adapter and a small inverter to plug my phone charger into and now that I'm writing this I realize the stupidity of all that DC -> AC -> DC conversion as well as taking up a lot more space. The Motopumps Airshot worked great, both for handling my high and low pressure needs with Tubliss and helping out with Micah's second flat. As to the route, for the parts we did I feel like it was only the one Alt where we encountered the mining company that would be considered "out of date" and like I said before I don't think anything we rode was private property. It's a shame this route can't be maintained since people are still clearly riding it and can provide ground reports even if they're not local. So, I don't know if he'll be mad or what but thanks Chip (@intothenew) and whoever else helped out for putting this ride together. And thanks again Micah. I had a great time, definitely would have shied away from some of that stuff if solo. Great meeting/riding with you! I'll chip in with my little bit at the end here as well. After we went our ways I took an hour and a half boot up the highway to my old stomping grounds of the Altoona PA area. I took a couple of hours to catch up with some old friends and have a great meal as well. 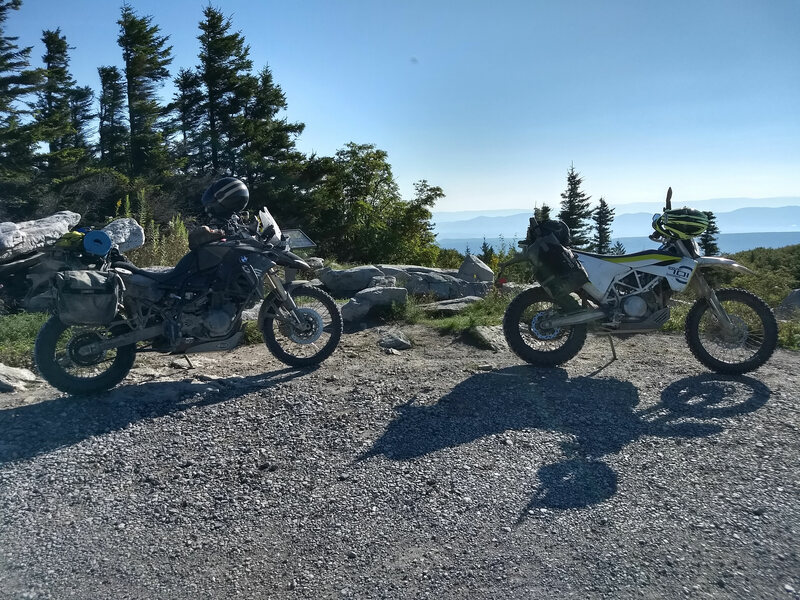 Originally I had intentions of leaving from there to link onto the MABDR and ride the PA portion of it to its nothernmost point and then ride the rest of the way home to Ontatio. Time however was not on my side by this point, so what I managed to do was ride east and connect with the MABDR in Mcveytown PA and ride north on it for the remainder of the day. This part of the MABDR is through the beautiful ridge and valley portion of PA. 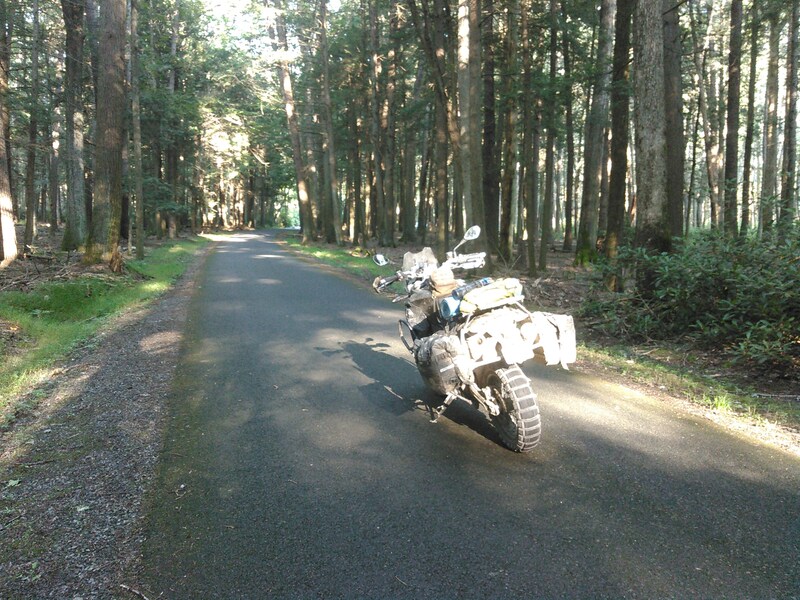 The gravel roads were not very condusive to motorcycle's in this area. A high crown in the middle of the 2 "tracks" with lots of loose gravel made everything just a little dodgy. I enjoyed being in the shade mostly though as the temps were pushing 95 degrees that day. On from there I entered into Rothrock state forest, which was simply beautiful. Roads were excellent here, mostly hard packed gravel which you could really sing on. 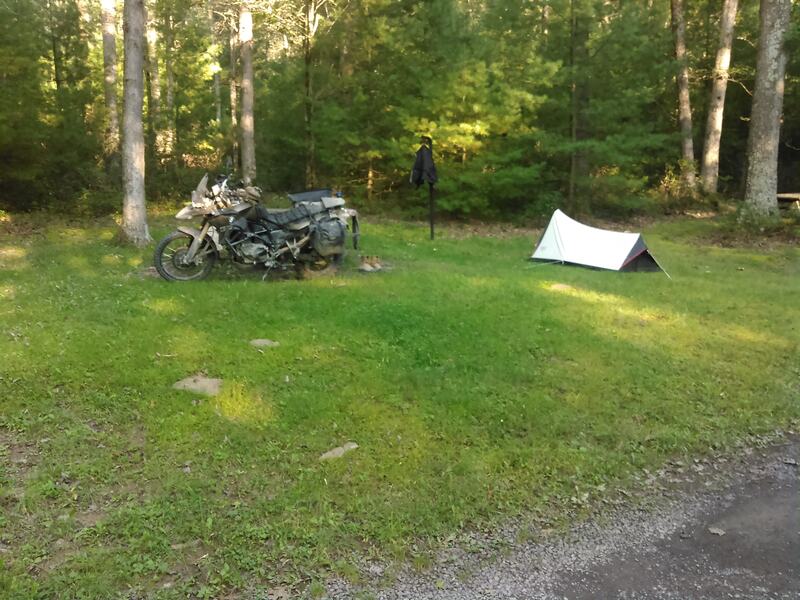 It was here that I came upon a primitive campsite option and took it up for the night. I had very spotty cell service but I managed to get a quick look at the radar which showed a storm just north of me brewing. It looked like it may stay north, but soon the rumbles came closer, too close for comfort. Right around dark the storm broke loose. I managed to stay mostly dry, but it did confirm that a new tent will be on my shopping list before my next trip, this one is no longer totally waterproof. Fortunatly though the storm was strong it was short, the rest of the night spent in peace. 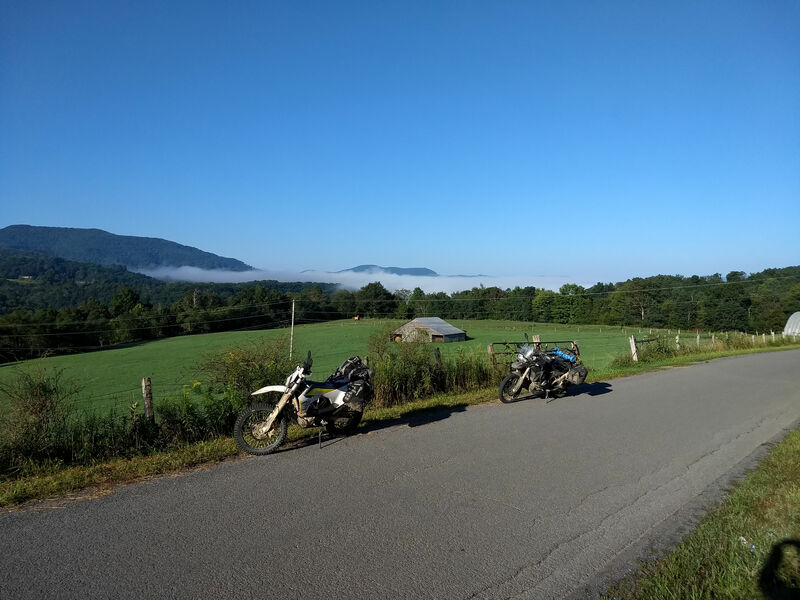 The next day I was faced the choice of riding out the rest of the MABDR at a slow pace and getting home very late, or opting for a quicker paved route north. Being away from my family for as long as I had I opted for the faster route - which still took me most of the day. 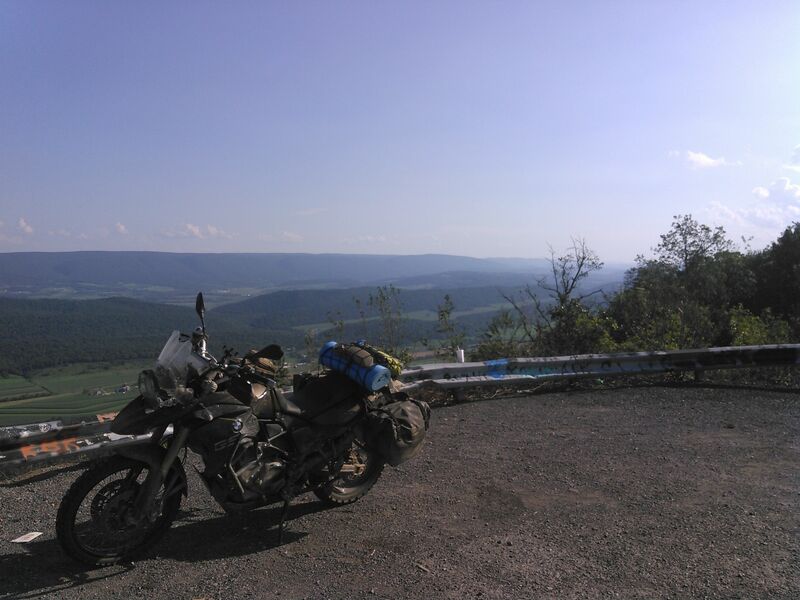 I took the beautiful Rt 144 north from Snowshoe PA up through Renovo. I've been on that road several times before and I still maintain it has to be one of the most beautiful motorcycle roads in the state. Long stretches of FUN but not overly challenging twisties, remote, little traffic, just beautiful. No regrets at all for taking that route. I headed west to make my way back to the border and saw a sign for something that jogged an old memory. 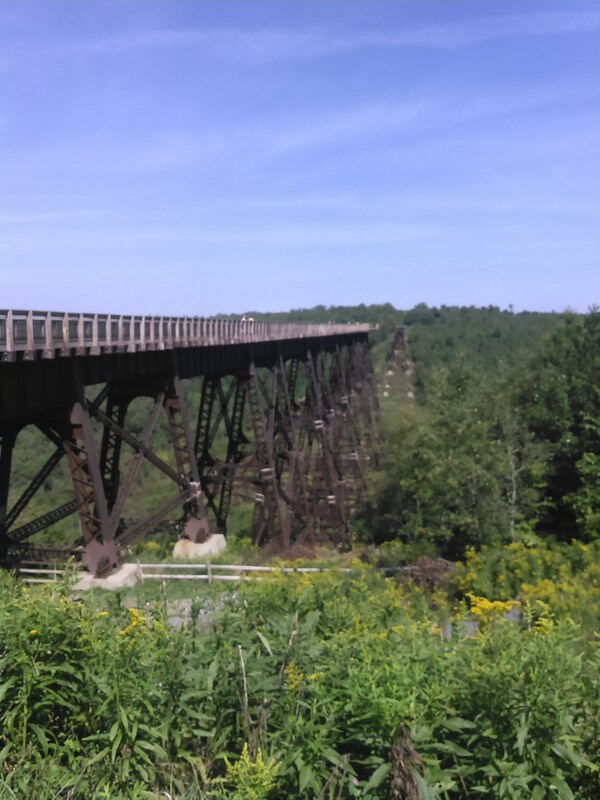 "Kinzua Bridge State Park- 3 miles" Almost without thinking I took the turn. 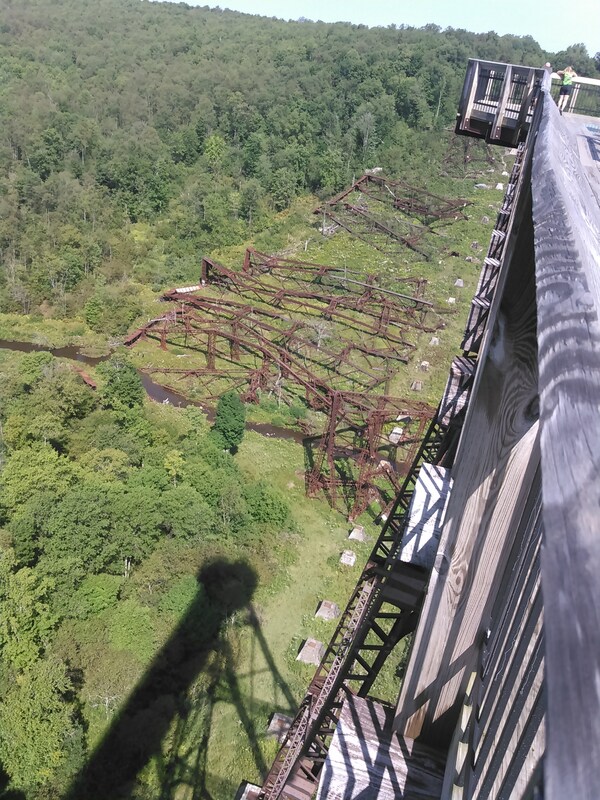 My family had taken me there when I was very young, I can barely remember walking across one of the tallest railroad bridges, looking down between the ties, worrying my leg might fall through... Well, thankfully the park was free and I could ride right in - which if you're ever traveling Highway 6 across northern PA I recommend you do. When I was there the bridge - built in the late 1800's, then rebuilt around 1900 - went all the way across the valley. 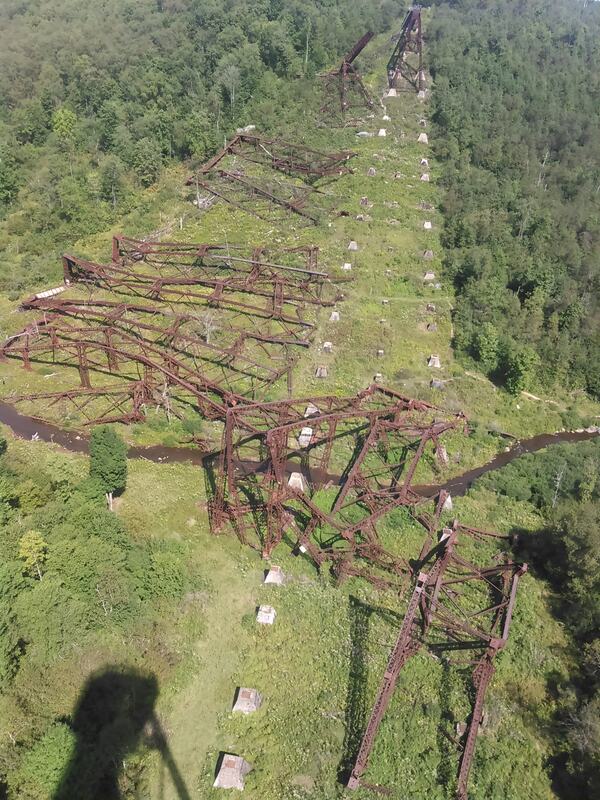 But in 2003 a tornado went through the valley and took down half of the bridge, quite a site to see. You'r still able to walk out halfway across the standing part of the bridge. Aside from that, and seeing a semitruck that took the entrance curve onto the Peace Bridge a little hot and rolled on its side (what a mess), it was an uneventful ride home. I spent the whole next day decompressing and unpacking, it was a good trip, but good to be home. My reflections on the trip are similar to Daves, glad I had him along to get me though the bits where that fear of getting stuck solo might have turned me around if I was alone. Having a partner definatly made the the trip a much fuller experience. The people of WV, are great, so colorful, friendly, interesting, just a pleasure to experience. The state is really a true motorcycle gem of the east. If you are nearby and have never ridden it its a MUST. You don't even need to plan a route, roads in WV have never let me down. 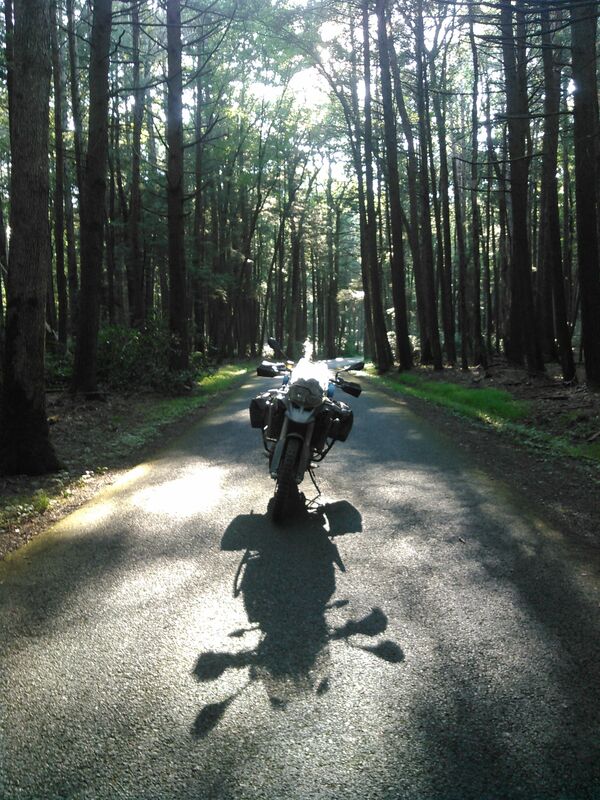 My bike, I knew the F800 would have its limitations on a ride like this, but it served me well. I had people tell me it was too big a bike for this ride, and it was tough, but I managed. Its very true that a smaller bike would have been far better suited, but I rode what I got, and had a great time doing it. My 2 flats I'll chalk up to my own ignorance, setting the preasure too low - lesson learned very well. Gear worked well, but a new tent is in order. I will say, if you ride this route, get the BEST tires you can. I did regret not going with a much more aggressive front. All in all it was a great experience that stretched me in several ways, which is what I was after. bobw and dstutz like this. Playing around and edited one of the more tougher alternate sections. Only the 3rd vid I've ever edited, I was just having fun with the music, but should have lowered the audio on the engine noise some. bronciii and dstutz like this. Love that camera angle, shows the suspension working and all the steering going on while you're going "straight". @14:10 - Rabbit tries to commit suicide. Route 1 - Alt 7 This was a really fun section. @9:45: I'm in the bushes! Route 3 - Alt 1, Wolf Creek Mountain Rd, another fun one. @11:17...middle of nowhere, but we've got phone service at the hunting lodge. Great ride. great ride report. I’m out of Westminster maybe one time we can hook up. Glad at least one of us had a working camera to catch Wolf Mountain Rd, it was a good challenge. Great ride report! Looks like a great route! I'm hoping to do some of this route in a few weeks when I have to go down to VA for work. @dstutz I have the Mosko Moto Reckless 80s as well. I have the V2 ones, which have a cutout on top for rear mounted fuel tanks. I wonder if you could contact Mosko Moto and see if you could get a new center portion for use on your bike? I would also check your rear wheel alignment. I'd imagine it might be a bit out of alignment, and that's why you only have rubbing on one side of the mud flap. Really great ride report. Much appreciated guys. Thank you for taking the time to post this ride report thread. Awesome RR. We love riding WV. I don't think there is a straight road in that state.